Noelle Pikus-Pace is headed to the Olympics for the second time, and bringing her good luck charms along for the ride. Team USA's Pikus-Pace, a skeleton slider, has her biggest fans — her husband and two children — by her side as she competes for the gold at Sochi. She's overcome difficult hurdles to get to 2014's Olympic games, including a freak accident and a devastating loss by just one-tenth of a second. 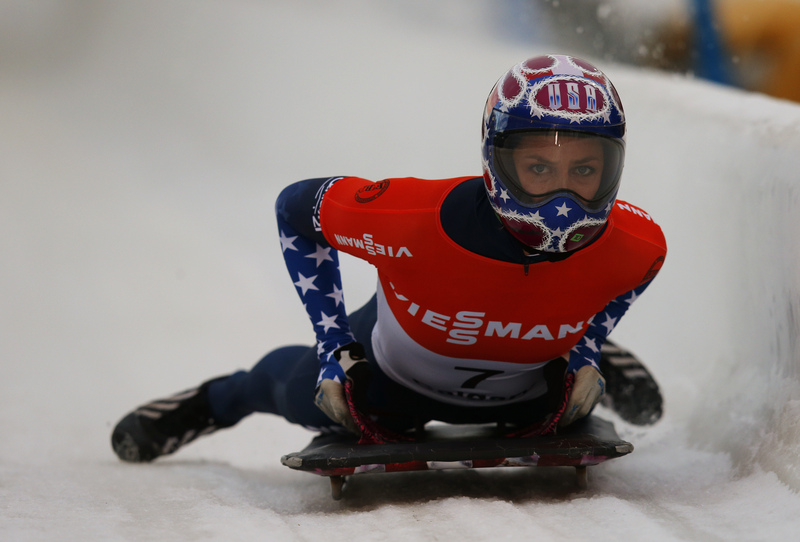 Pikus-Pace, a Utah native, won five medals at the FIBT World Championships in skeleton racing. The Olympic Trials in 2005 was a huge blow to her athletic career after a runaway, four-man bobsled careened from the track and hit her. She fractured her right leg and was unable to compete in the 2006 Winter Olympics. Pikus-Pace took some time off to recuperate, finishing her education, opening her own hat business, and starting a family. In 2009, she came back to compete with unparalleled vigor. Can we just go over that one more time? She got her master's in business administration, started her own company, had a baby, all while training for the Olympics. What can't this woman do? Pikus-Pace competed in the 2010 Winter Olympics on a sled her husband built. Unfortunately, she missed a medal by one-tenth of a second, coming in at fourth place. She retired after the 2010 games and had another child. With a growing family, she still wanted to make her Olympic dreams come true, and she wanted them to be there. I had a really, really good season (in 2012-13) and honestly, I one hundred percent attribute that to having my family with me ... Just the peace that I would feel every single race … It was just the normalcy. They are my priorities. And so they bring me back to earth. A lot of times you get into a competition and you think it’s so much bigger than it really is. It isn't exactly the cheapest of family vacations, either. Financing an Olympic bid comes out to nearly $60,000 per World Cup season. But balancing a family and all the hard work that comes with skeleton racing is worth it, regardless of the stress it can bring. Her five-year-old daughter is following in her footsteps, having just completed her first skeleton run in January.